Flora Friday in Oz: Walls Lookout, Pierces Pass. After the Bushfires. It's good to get back in the bush again, the last time was in mid October. This outing was to look at one of the areas where the big fires went through nearly seven weeks ago in spring. While there were large areas burnt a green tinge was evident with regrowth from underground tubers, rhizomes and lignotubers, plus the epicormic growth on trees and shrubs. It was interesting to see the patchwork way the fire would burn some large areas and miss others and visa versa. A green tinge is starting to appear amongst the brown burnt areas looking towards Mount Banks. Sedge-type plants seem to emerge first and give the heath areas a green cover. New growth sprout from the lignotuber of this 'mallee' type Eucalyptus sp. 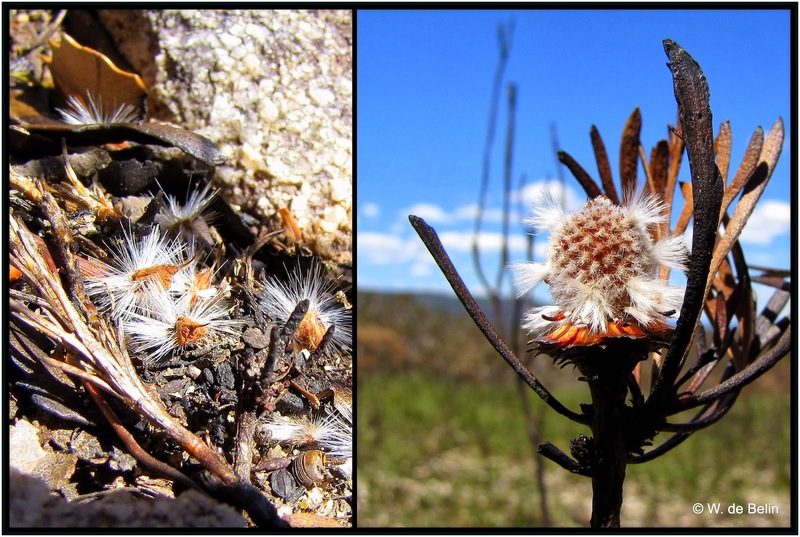 After casting its seeds this Petrophile puchehella - Conestick takes on the appearance of a rose. Thysanotus sp. - Fringe Lily. Leptospermum sp. - Tea Tree starting afresh. leaves grow fairly quickly, pushing up after the top was burnt off. Platysace lanceolata - Lance-leaf Platysace, Shrubby Platysace, Native Parsnip. 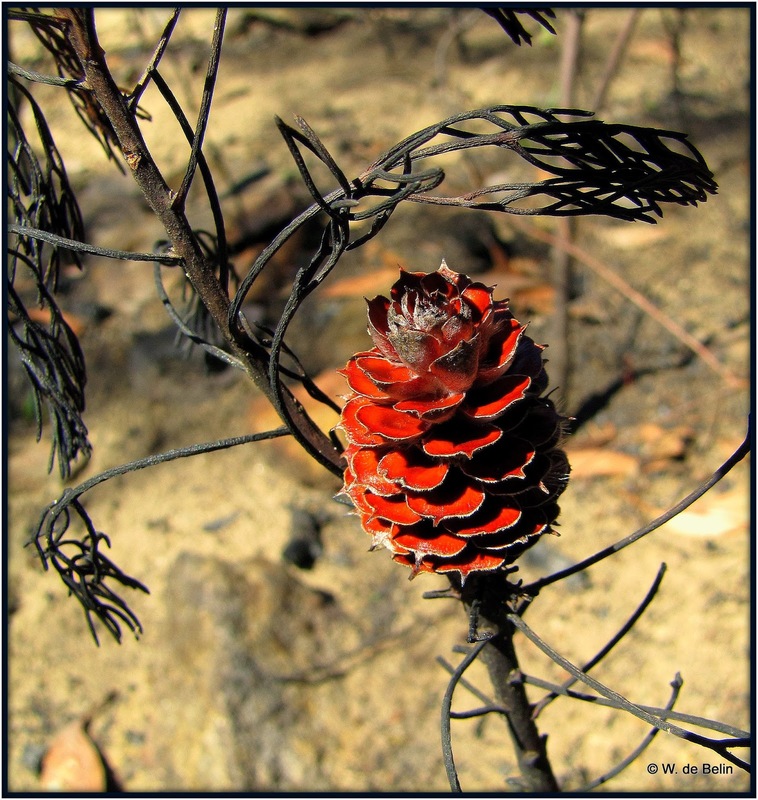 Banksia spinulosa - Hairpin Banksia has two ways of surviving after fire, dropping seed and sprouting from an underground lignotuber. Like a shining light in the gloom, Actinotus helianthi - Flannel Flower. A new beginning for a plant I'm not sure of. Leptospermum sp. - Tea Tree (with flaky bark). Seeds shed to produce, in a few years, more flowers like this. Kunzea capitata - Pink Kunzea, Pink Buttons. Some Lambertia formosa - Mountain Devil missed the flames but others have to start again. Epicormic growth gives this Eucalyptus sp. another chance. Grevillea laurifolia - Laurel Grevillea. Tristania neriifolia - Water Gum. One side scorched, the other side survives to produce a flower. Leptospermum sp. - Tea Tree (with smooth bark). Hybanthus monopetalus - Slender Violet. Easy to see the track now. Great view of the Grose Valley. Warning: video contains mild coarse language. This dead Cicarda is now food for the ants. Transverse Ladybird - Coccinella transversalis. It can snow here, so that might be why the fly has a nice furry coat.